The sharp sell off in the euro dollar came to a brief halt yesterday, with the currency pair ending the trading session marginally higher, but with a relatively deep wick to the upper body of the candle, suggesting that bearish sentiment remains in place, despite the higher close. The good news for euro bulls is that the low of day found some support at the 1.47 price handle, a key level which provided a platform early in November, and may once again offer some cushion to the recent decline. However, this analysis has to be counterbalanced by the moving averages, with the 9 day having crossed below the 40 day moving average yesterday, which adds further to the bearish nature of the daily chart in the short term, and coupled with the recent crossing of the 9 and 14 day averages, which have started to turn lower, it is evident that broad sentiment has shifted from bullish to bearish in the medium term. The key levels remain those at 1.47, followed by that at 1.45, and should both of these be breached, then a test of potential support in the 1.43 region becomes a real possibility, and given the resurgence in the US dollar of the last few days, we could even seen this before the end of the year. 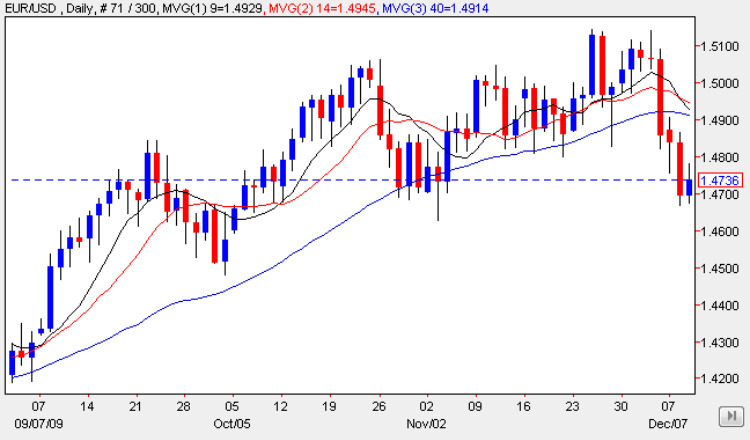 For the bulls the 1.5150 top is now clearly defined and for any recovery we need to see a break and hold above this level which would then provide the necessary springboard for a move higher once again, but before this can be achieved the deep congestion now established above will require some considerable momentum to breakthrough if this is to be achieved in the short term. Among the items of fundamental news for the euro dollar the most significant are in the US where the unemployment claims and trade balance figures are expected at 14.30 GMT. Given the much better than expected nfp data last Friday it will be interesting to see if the unemployment claims too have fallen even though analysts are forecasting this number of be slightly higher than previous. The consensus is for 463k against a previous of 457k. The trade balance number is expected to come in at -36.9bn.